Fast food is something that we usually seem to associate with America and Britain – well, not surprisingly as a 2008 survey revealed that 45% of Brits and 44% of Americans didn’t think they would be able to give up the taste of it! 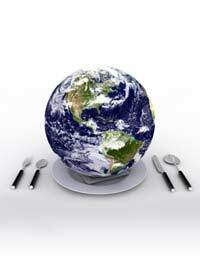 In fact, fast food is available around the globe, and not always in the same form that we think it might be. For example, Chinese food sold in China will be vastly different to the fast food we will order from a Chinese take away in the UK. The same also applies to Indian cuisine which is nothing like the menu in your average Indian restaurant in the west. Panipuri - a round, hollow Indian bread (or Puri) fried until crisp and filled with a mixture of tamarind, chilli, potato, onion and chickpeas. Tea-egg - hard-boiled eggs stewed in a salty tea liquid, often seasoned with soy sauce and Chinese five-spice. More recently, Western style fast-food restaurants are springing up, some selling exclusively in Chinese dishes such as California Beef Noodle King, but even this chain prides itself on using only Chinese ingredients. The most popular fast food that you’ll find in Middle Eastern countries are flatbreads and falafel, which are fried, spiced chickpea (or sometimes fava bean) balls. These are usually sold by street vendors and independent traders. Also a staple of Middle Eastern cuisine is the kebab house. These are very popular, especially in Turkey and the Lebanon. Kebab shops also popular across Europe and the UK. The French like their fast food served in sandwiches, Panini and crepes, and in the winter you can usually also find roasted chestnuts sold on the street for hungry, cold shoppers. In Germany you’ll find sausages – even curried sausages called ‘currywurst’ served with chips, mayonnaise and ketchup. Beer is also on sale at many street stands to drink with the delicacies. Middle Eastern style food is also popular in Germany – treats such as halloumi and falafel. So – take your pick from all the different and diverse street and fast food options – fast food doesn’t start and end with the burger and fries!